Get your green on with Graeme Base. 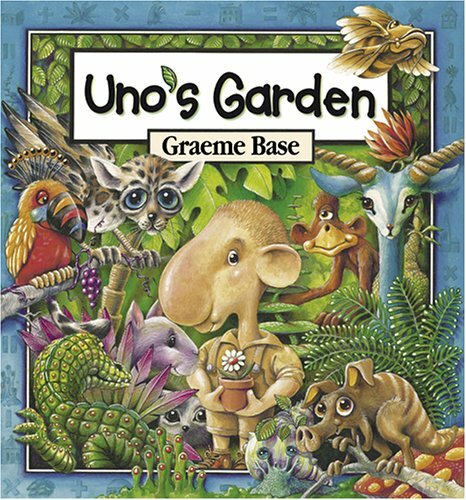 Uno’s Garden and The Waterhole are perfect reads for Earth Day. The illustrations are amazing and captivating. Click here to see more books suitable for our younger “green” generation. Once again, beloved author Graeme Base introduces readers to a new world. And again, he interweaves the story with hidden images and mathematical problems (and solutions! ), creating a book that can be read over and over, and at different levels for different ages. When Uno arrives in the forest one beautiful day, there are many fascinating and extraordinary animals there to greet him—and one entirely unexceptional Snortlepig. Uno loves the forest so much, he decides to live there. But, in time, a little village grows up around his house. Then a town, then a city . . . and soon Uno realizes that the animals and plants have begun to disappear. Uno’s Garden is a moving and timely tale about how we all unknowingly affect the environment around us, just by being there—and how we can always learn from our mistakes and find ways of doing things better. It’s an illuminating blend of storybook, puzzle book, and math book. Publisher’s synopsis: In the tradition of his best-selling alphabet book, Animalia, author and illustrator Graeme Base takes young readers on an exhilarating journey of discovery with an ingenious fusion of counting book, puzzle book, storybook, and art book. From the plains of Africa and the jungles of the Amazon to the woodlands of North America and the deserts of outback Australia, the animals come together to drink from the water hole. But their water supply is diminishing. What’s going on? Each sumptuous landscape illustration conceals hidden animal pictures for readers to find as they count the animals that visit the water hole and try to solve the mystery: will the animals come back or is their water source gone forever?